The sushi definition is pretty straight forward. 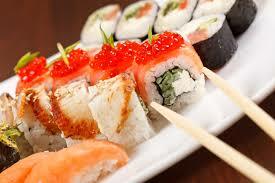 Sushi is a Japanese food that contains rice. It is often confused with sashimi which is very similar to sushi in its preparation and presentation, but the key difference is that sashimi does not contain rice. The rice found in sushi is distinct, often cooked with vinegar and tempered with a bit of sugar. The vinegar and sugar both provide flavor, but the sugar serves the dual purpose of making the rice somewhat sticky—enough to prevent the grains of rice from falling apart in the sushi roll. The rice may be brown or white. Other ingredients vary greatly, from raw fish (what most people often think of), to cooked fish, to vegetables, and more. Some people have taken to trying even the most unexpected ingredients in their sushi rolls—ingredients such as peanut butter, pickles, and cream cheese. Indeed, a very popular sushi roll (often dubbed, “The Philadelphia Roll”) is one in which the main ingredients are cream cheese and salmon. This roll provides a nice salty taste, while giving out a creamy texture from the cream cheese. 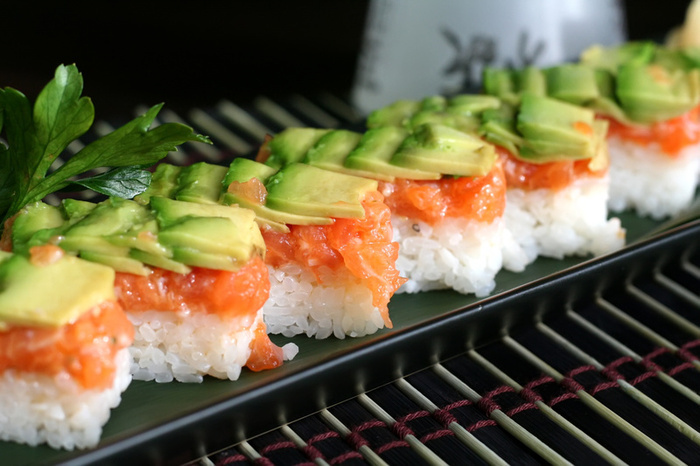 While many assume that sushi is a delicacy only to be enjoyed at sushi bars, there are really only a few ingredients involved. Therefore, technically, anyone can make sushi. The ingredients necessary to traditional sushi are rice, as mentioned and described above, and nori. Nori is the green “wrapper” you see on a sushi roll (well, sometimes you won’t see it, because often the rice is on the outside). It has a distinct crunch to it when you bite into a roll, but it is actually quite malleable and unexpectedly thin before becoming a part of a sushi roll. Nori is made of seaweed and has been described as having both a distinct yet neutral flavor. 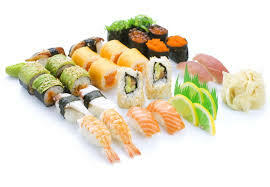 Americanized versions of “sushi” have often replaced the nori with other foods that may be rolled, such as tortillas. Additionally, some may forgo the nori altogether and simply stick with the rice, though this is less common. Other unique characteristics of sushi involve a given chef’s method of presentation. Some garnish a particular roll with fish roe (eggs), sometimes dyed to more eye-catching colors than their natural presentation. Other garnishes include thinly sliced vegetables, tempura crisps, unagi sauce, and the like. What you will almost always find accompanying your sushi rolls is a dollop of wasabi and pieces of ginger, which are meant to cleanse your palate after each piece of sushi. Cleansing your palate allows you to appreciate the taste of the next piece more fully. Soy sauce is often a condiment of choice, as well, as many people enjoy dipping their sushi in it. Though sushi is often enjoyed in more formal settings using chopsticks, it is also not uncommon for sushi to be eaten with one’s hands/fingers. Indeed, chopsticks are more formally suited for sushi’s brother, sashimi. Indeed, the quality and preparation of the rice in sushi lends itself to staying in tact, while sashimi, because of its lack of rice, would be much trickier to eat in such a fashion.